Drinks with the President, was again kindly hosted by Past President William and Pam Stevens in their delightful home. 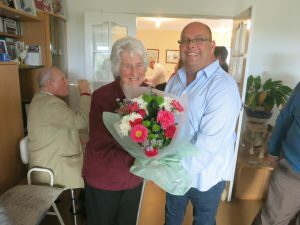 The sports and social committee ably led by Past President Clive had organised the magnificent event, and a special thanks has to go to all the wives who did so much work in preparing the delicious spread, setting it out on the day and then clearing and washing up afterwards. A special mention should also be made of the scrumptious deserts that had been prepared and it should be mentioned that a number of Rotarians were seen returning to the table more than once despite the calorie count warning! The West Cliff Theatre management and all staff who helped host the Christmas Carol Concert, raising over a £1,000 and to St James’ Church, who allowed the use of there excellent hall for the performers to change in and for the celebrations afterwards, both a no cost! The Principal and staff of the CCHS for their help and support together with Pinnacle for the use of the kitchen and dining room and all the Caretaking staff that contributed so much to making the day a great success. The staff and children of Engines Primary School that raised over £450. 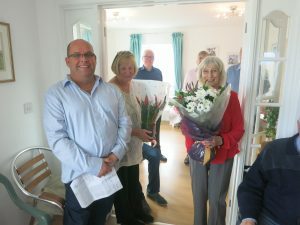 President Mark finished by presenting bouquets of flowers to our host Pam Stevens and the main power behind the organisers of the event Margarett Gowers and Pam Norris. All receiving well deserved rapturous support from the throng.